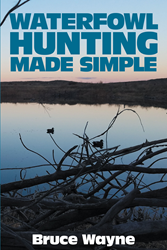 Recent release “Waterfowl Hunting Made Simple” from Page Publishing author Bruce Wayne is an educative book on how to simplistically yet successfully game for waterfowls. Bruce Wayne, a fisherman, outdoorsman, and avid hunter with experiences serving the US Marine Corps for six years and as a volunteer hunter education instructor for Colorado Parks & Wildlife Department, has completed his new book “Waterfowl Hunting Made Simple”: a potent manual with details pertaining to orthodox waterfowl hunting at a minimal cost and with efficacious results. Published by New York City-based Page Publishing, Bruce Wayne’s cogent book reflects the author’s astounding passion for the craft of hunting through comprehensive parameters in doing such work. This material also reminds that a sport without fun is no sport at all. Readers who wish to experience this constructive opus can purchase“Waterfowl Hunting Made Simple” at bookstores everywhere, or online at the Apple iTunes store, Amazon, Google Play, or Barnes and Noble.